In the wake of World War II, zoologist and adventurer Captain R. J. MacCready is sent to the frozen mountain valleys of Tibet to find a creature of legend that may hold the secret to humankind’s evolutionary future—or the key to its extinction—in this explosive follow-up to Hell’s Gate. It is 1946, and the world is beginning to rebuild from the ashes of the devastating war. Marked by the perilous discoveries he encountered in the wilds of Brazil, Captain R. J. MacCready has a new assignment on the other side of the globe—a mission that may help him put the jungle’s horrors behind him. He is headed for the Himalayas, to examine some recently discovered mammoth bones. Arriving in Asia, Mac learns the bones are only a cover story. He’s really there to investigate an ancient codex allegedly written by Pliny the Elder, a fascinating text filled with explosive secrets. The Roman naturalist claimed to have discovered a new race of humans, a divergent species that inspired the myth of the Yeti and is rumored to have the ability to accelerate the process of evolution. If Pliny’s assertions are true, this seemingly supernatural ability holds unlimited potential benefits—and unlimited potential for destruction. Charged with uncovering more about this miracle species, Mac sets off into the remote mountain valleys of Tibet, using the codex as his guide. But the freezing climate and treacherous terrain are only the beginning of the dangers facing him. He must also contend with the brutal Chinese army and a species of native creature even the Yeti seem to fear. The deeper he plunges into the unknown, the more certain it appears that Mac and the associates who join his odyssey may not make it out alive. 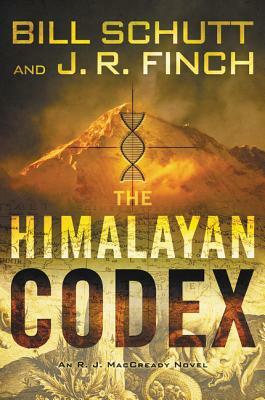 Combining plausible science, history, and action-packed thrills, The Himalayan Codex is a page-turning adventure sure to enthrall fans of James Rollins, Michael Crichton, Dan Brown, and Douglas Preston and Lincoln Child. Bill Schutt is a vertebrate zoologist and author. He is a research associate in residence at the American Museum of Natural History and a professor of biology at LIU Post. Bill’s first book, Dark Banquet: Blood and the Curious Lives of Blood-Feeding Creatures, was critically acclaimed by E. O. Wilson and the New York Times. His next nonfiction work will explore the natural history of cannibalism. Bill lives with his wife and son on the East End of Long Island, and he is currently working on a sequel to Hell’s Gate with J. R. Finch. J. R. Finch is a painter, history buff, and cave explorer. He lives in New York City with three cats.